On the 7th day HE rested. I need a rest. So does my kid. It’s been a little too much – the travels, the back-to-back meetings the week after, all those posts I just had to get out about the trip, the extra coaching I’ve had to give Youngest (who didn’t learn about words till he was 4 and has a precarious hold on grammar, vocabulary and meaning) .. I kept thinking, all I’ve got to do is keep it all balanced. First things first in the morning, second things later in the afternoon, and the last things at night. All I need to do is prioritize and I’ll keep it all together. Sunday night Heart Guy told me the same thing after he caught me pushing Youngest to finish an art assignment. Even HE rested. Youngest needed to rest too. So did I.
I’m a bit of a Tiger Mom. I have a tendency to overdo things; to push myself and my kids too hard. Not just Youngest, all the others too. Thank GOD, he’s watching out for my kids and given them enough wisdom to take their own breaks when I pushed too hard. Thank GOD there’s Heart Guy around to watch out for Youngest. Are you prone to pushing too hard? Is today your 7th Day? Is it time to take a break? Audrey If only I could find the balance then life would be grand, but maybe that is why being human can be so hard. The balance is forever changing. 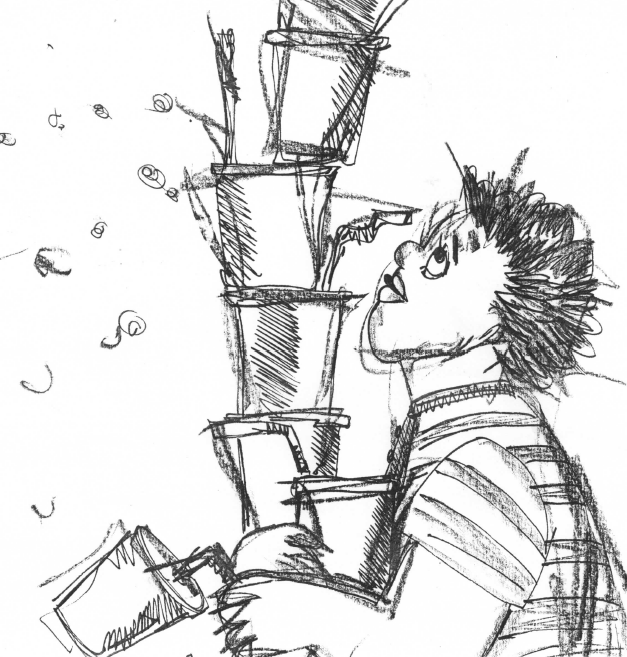 Here I am 20 years after I wrote that poem and still trying to stack 7 cups of soda and walk across a café unscathed! We just gotta keep trying friend;) Or do our words and stories and pictures come from all that tilting and wobbling? Love this poem! I may be a tiger Nanna if there is such a thing?! been on babysitting duties four days a week as my daughter has gone back to work….her ‘cub’ is 2 next month …. we have to keep him very occupied, he’s that sort of kid, he doesn’t sit still very often, he asks repeatedly ‘what’s this, what’s this?” in his teeny tiny man voice, he dances, he rolls on the floor, he torments the dog by chasing her tail, he tries to climb up my library shelves….not to read, but to create some sort of book mattress on the floor behind him should he need to break a fall before I get to him from the other side of the room….he is learning to swim, talk, count, negotiate the staircase safely, how to eat with his own very blunt knife and fork, learning not to torment the dog, or pull plants out of pots, or squeal until his breath runs out, and he is smart enough to have learnt already that he has Nanna wrapped around his wee little finger. He has not had a day time nap for three months……roughly around the same time that this Nanna started taking them the minute his mother had come to collect him. I’m not sure if it’s balance or our break even point in our house Audrey! Well Nanna, if it all the eggs you’re both juggling come crashing down then they will;) You can always make scrambled egg from the mess. I’m envious you get to be grandma. Heart Guy and I are waiting. All we’ve got is the grand-dog, who yips! I’m kind of glad it’s happened in our forties and not our fifties just so we still have enough energy to keep up with him! !